Danish sprinter Jeanette Ottesen and South African freestyler Devon Myles Brown each won a pair of events on the first night of the Mare Nostrum meet in Canet-en-Roussillon, France. 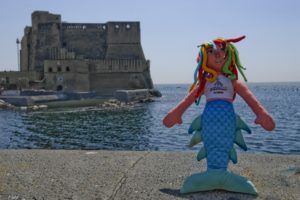 This meet serves as the midpoint of the weeklong Mare Nostrum tour, which began last weekend in Monaco and wraps up this coming weekend in Barcelona. Ottesen won the 50 free and 100 fly, setting new Danish records in both – one of those races, the 100 fly, saw her break new ground nationally as the first-ever sub-57-second butterflyer in the country’s history. Ottesen made big moves in the money-earned lists, gaining major ground on current series leader Katinka Hosszu, who is not competing in Canet. Meanwhile men’s money leader Ryosuke Irie kept adding to his win total, dominating a tough 200 back field with a big swim. There was a tie for the top seed out of prelims, but Denmark’s Jeanette Ottesen broke it convincingly in finals. Ottesen, already second on the women’s money-earned list, went 24.40 to run away from fellow top seed Arianna Vanderpool-Wallace. That represents a drop of over four tenths from prelims, and Vanderpool-Wallace, the Bahamian Olympian who swims in the U.S. with SwimMAC, also dropped a few tenths to go 24.69. That time for Ottesen is a new Danish record, breaking her old mark of 24.54, which she set in 2013 and tied just a few months ago. It also improves her 5th-ranked time in the world for 2014. She is now just .02 out of fourth place. Getting her first taste of the Mare Nostrum circuit this season was Brit Francesca Halsall, who took third in 24.76. Joining her under 25 were Anna Santamans of the host country (24.83) and Denmark’s Pernile Blume (24.86). Natalie Coughlin was the top-finishing American, hitting 25.00 right on the nose for sixth. Nathan Adrian continues to put together a dominant regular season as he hurtles towards some important end-of-summer competitions. The winner of both sprint races in Monaco kept his streak alive by dominating the men’s splash-and-dash with a 21.68. That was more than three tenths up on a strong field, and Adrian was the only swimmer under 22 seconds on the day. Adrian also showed some great consistency, putting up the exact same time he used to win this race over the weekend in Monaco. France’s Florent Manaudou took second in front of his home crowd. His 22.00 was safely ahead of Adrian’s American and Cal Aquatics training partner Anthony Ervin. Ervin went 22.21 for third place. Ervin had to fight hard for that number three spot, as a pair of swimmers also went 22.2 chasing him down. Russia’s Oleg Tikhobaev was 22.25 and Great Britain’s Ben Proud took fifth at 22.29. Devon Myles Brown put South Africa on the board with a win in the men’s 400. The former African Championships medalist went 3:50.93 to outlast a stiff challenge from Spain’s Miguel Duran Navia and Poland’s Filip Zaborowski. The Spaniard was 3:51.91 and the Pole 3:51.97 in a great battle for second. Top-seeded Pal Joensen, competing for the Faroe Islands, took fourth with a 3:52.14, with Britain’s Max Litchfield (3:52.41) in tow. 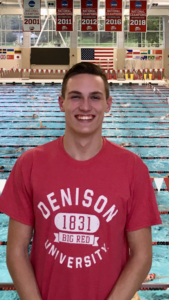 Canadian and California NCAA swimmer Jeremy Bagshaw was just behind with a 3:52.64. Things heated up for South Africa as Karin Prinsloo followed Brown’s win up with her own victory in the women’s 200 back. Topping some big names in the field behind her, Prinsloo went 2:10.84 for the meet title by over a full second. Iceland’s Eyglo Gustafsdottir took second, going 2:11.86, and she, too, was pretty far removed from the rest of the field. The third and final money-earning spot went to Russian youngster Daria Ustinova. Ustinova was 2:12.47, and beat out Polish star Alicja Tchorz (2:12.94) for that third position. The backstroke fields at this meet are looking extremely tough, but Ryosuke Irie continues to show that he’s on another level entirely, at least at this point in the season. Irie paced the men’s field easily in 1:54.97, winning by just over two seconds. Already holding a full-second lead at the halfway mark, the Japanese superstar topped Polish national record-holder Radoslaw Kawecki‘s 1:56.98 with ease. A pair of young Americans filled in the next two spots. NCAA standout freshman Ryan Murphy was third, putting up a 1:58.33, and his Cal teammate Jacob Pebley went 2:00.10 for fourth. Home country swimmer Benjamin Stasiulis picked up fifth for France, going 2:01.92. Denmark got another win from one of its female studs in the 100 breast. Second in Monaco, Rikke Moller Pedersen took advantage of Kanako Watanabe‘s absence to win the women’s race in 1:06.32. That’s a full second faster than she was over the weekend, and approaches her season-best of 1:06.19, which sits second in the world. Moller Pedersen blew out the field, with Spain’s Jessica Vall Montero finishing second at 1:07.76. Her Spanish teammate Marina Garcia took third to match the result of her California collegiate teammate Murphy from the event before. Garcia was 1:08.92. Great Britain’s Molly Renshaw went 1:09.32, and Finland’s Jenna Laukkanen was the last swimmer under 1:10, putting up a 1:09.97. The top American was 6th, that being SwimMAC’s Katie Meili at 1:10.19. The men’s breaststroke was an outstanding race, ending in one of the night’s closest touchouts. Making it more exciting was that it happened between Great Britain teammates. Ross Murdoch, a Scottish representative on the British squad, went 1:00.19 to just touch out Adam Peaty‘s 1:00.23 for the event win and the winning payout. Making it an exciting three-person battle was Yasuhiro Koseki of Japan, who went 1:00.36 for a narrow third-place. Those three checked out pretty well from the rest of the field. Fourth-place Giacomo Perez Dortona of France went 1:01.04, with Russia’s Vsevolod Zanko fifth at 1:01.36. The entire rest of the heat was very close, with Giedrius Titenis (1:01.68), Grigory Falko (1:01.73), and Damir Dugonjic (1:01.75) all within a tenth of one another to round out the A final. The top seed coming into finals, Japan’s Sakiko Simizu won the women’s 200 IM in a second-straight touchout of .04 seconds. Simizu touched the wall at 2:12.58 to just edge out Hungarian Evelyn Verraszto and her 2:12.62. Simizu led by about eight tenths heading into freestyle, but Verraszto charged hard to make it a photo finish. Still, Simizu managed to dig out the big win. Those two both surged ahead of Zsuzsanna Jakobos and Melanie Margalis over the final 50 meters. Margalis actually led at the 150-mark with the Hungarian Jakobos second, but the duo couldn’t quite hold on to the lead as Simizu and Verraszto battled back. Jakobos wound up third in 2:12.85 and Margalis dropped to fourth at 2:13.12. Poland’s Alicja Tchorz took fifth swimming in her second final of the night. Her 2:16.78 just beat out the 2:16.96 put up by France’s Lara Grangeon. Japanese swimmers pulled off a sweep of the first day’s IM events – Daiya Seto turned in a 4:13.06 that easily dominated a sparse men’s field that featured two disqualifications. Spaniard Marc Sanchez Torrens took second, trailing Seto by a ways at 4:19.86, and Wales swimmer Thomas Haffield went 4:20.05 for third place. Both Britain’s Lewis Smith and Brazil’s Thiago Simon were listed as disqualifications in the event. Smith was the 4th seed coming in and Simon the 5th. Jeanette Ottesen picked up win #2 by pacing the 100 fly just as she did in Monaco. In fact, despite the double with the 50 free, Ottesen was faster here than in Monaco over the weekend; further yet, she was faster than she’s ever been before, breaking her own national record of 57.19 and becoming the first Danish woman sub-57 with a 56.96. That ranks second in the world for 2014 (a spot she already owned) and gets her within half a second of top-ranked Sarah Sjostrom. Canadian Noemie Thomas, a new addition to the tour in Canet, took second with a 58.99, and Israel’s Amit Ivry also picked up some prize money with a third-place 59.53. Also under a minute in the race: Britain’s Alys Thomas (59.57), France’s Marie Wattel (59.63) and Brit Rachael Kelly (59.79). Poland’s Konrad Czerniak held off a pair of Japanese challengers to win the men’s 100 fly, putting up an impressive 52.31. That’s still half a second off of Czerniak’s season-best, which sits 5th in the world. He got the touchout here, though, over Takuro Fujii and Hirofumi Ikebeta of Japan, who were 52.48 and 52.54 respectively. American Tom Shields was left just outside the money spots, taking fourth at 52.64. He still got in just a few hundredths ahead of Russian Viacheslav Prudnikov, who was 52.68. The host country had its biggest moment in the women’s 200 free, going 1-2 in a solid 4-way race. Camille Muffat was the big winner, putting up a 1:56.26 that should rank her 5th in the world for 2014 and bump Katie Ledecky to 6th. Behind her was countrywoman Charlotte Bonnet, who went 1:57.00 to outrun the field by just over half a second. Russia’s Veronika Popova and South African Karin Prinsloo were both in the hunt as well. Popova took third at 1:57.60, and Prinsloo, coming off of an earlier 200 back win, went 1:57.85 for fourth. 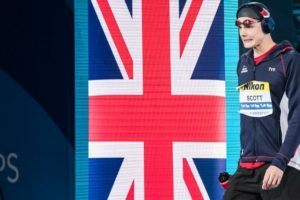 Great Britain’s Jazz Carlin (1:59.25) and Caitlyn McClatchy (1:59.70) were the last two swimmers under the two minute barrier. South Africa’s Devon Myles Brown became the second double-winner of the day when he took the final event. His 1:47.70 paced the 200 free by a second after he won the 400 earlier in the session. Second place went to Russian Artem Lobuzov at 1:48.71. France’s Jeremy Stravius jumped into the top three, rolling in just behind Lobuzov at 1:48.93. Emmanuel Vanluchene went 1:49.31, kicking off a whole series of men at the 1:49-mark. Viacheslav Andrusenko (1:49.72), Kenta Hirai (1:49.92) and Daniel Skaaning (1:49.98) all snuck in under 1:50 to close out the day. The meet will conclude tomorrow with prelims and finals, before the series heads to Barcelona for its third and final stop. Correction. Stravius third in the 200 free. And the young Marie Wattel in 59.63 in the 100 fly, close to her PB. A sub 59 is possible next month. Any results on the womens 800m free yet?